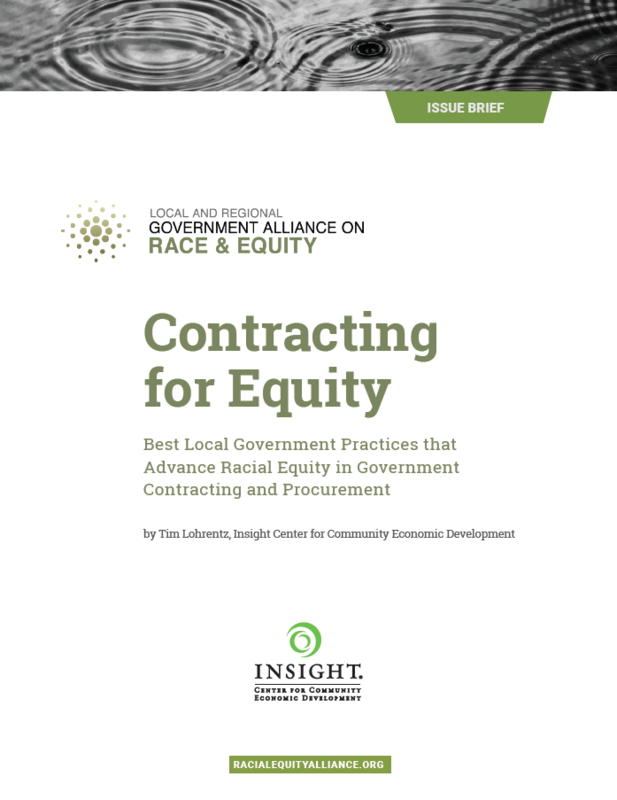 The Government Alliance on Race and Equity (GARE) joined forces with the Insight Center for Community Economic Development and author Tim Lohrentz to produce this hands-on issue paper on a topic familiar across governmental jurisdictions, contracting and procurement. Local governments procure and contract for a variety of things – from complex construction or architectural services to supplies, all of which help to keep government running. Before the Civil Rights movement, government contracting and procurement policies and practices generally excluded people of color and women. Although discrimination is now illegal, government procurement and contracting is generally not equitably distributed. Contracting inequities are both internal to the government – how the government does business – and also external – driven by the larger economy and how prime vendors and prime contractors to the government do their business. Within governmental jurisdictions that are working to advance racial equity, a common area of interest is the spending of government dollars. Our goal: local and regional government dollars used for contracting, consulting and procurement should benefit the communities we serve, proportionate to the demographics in our communities. This issue brief provides a common approach to furthering the field of practice of contracting equity within government. We have assessed current successes and challenges of jurisdictions that are a part of GARE, as well as identified additional jurisdictions that are furthering the field of practice. The strategies offered are practical and useful, helping to create equitable government and communities. Stay tuned for a webinar on the topic in January.